The database enables users to browse a set of seven of Scharf’s richly illustrated sketchbooks preserved in the Heinz Archive of the National Portrait Gallery. These were compiled as part of Scharf’s duties as ‘Art Secretary’ to the Manchester Exhibition and record his hugely ambitious survey of hundreds of old master paintings and portraits then in collections up and down the country. The project highlights how Scharf’s papers represent a still largely untapped treasure trove of material for historians of the collecting and exhibiting of art in Britain. The scope of the Art Treasures Exhibition is head-spinning: drawing on hundreds of British collections, it assembled 16,000 works of art within a vast iron, brick, and glass pavilion, dubbed the Art Treasures Palace, erected at Old Trafford on the outskirts of Manchester (fig.2). 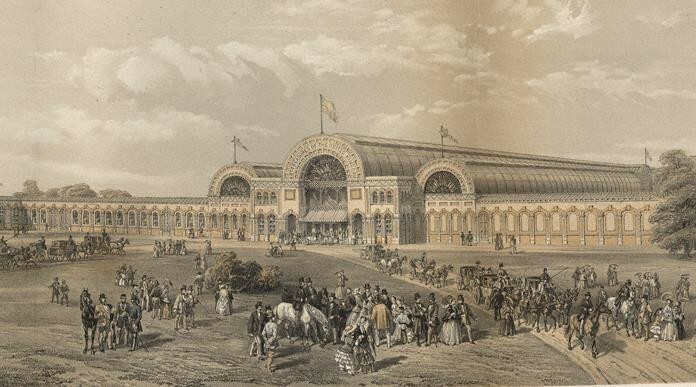 First proposed in February 1856, the exhibition ran from 5 May 1857 to the following October, attracting around a million visitors. An excellent monograph on the exhibition was published in 2011 by Elizabeth A. Pergam, but Scharf’s role in the enterprise, and the scale of his achievement in sourcing, sifting and arranging hundreds of its exhibits is still in need of greater definition. The database greatly adds to our knowledge of Scharf’s role, contributing around 200 further identifications/ corrections to the published record of what was on display, and is therefore of huge interest to provenance researchers. Supportive essays further investigate how items were exhibited, where they came from, and where they are now. The first systematic plans and digital reconstructions of relevant sections of the Manchester Exhibition’s innovative chronological hang are also provided, and users of the database can browse individual pages of each sketchbook, zooming and rotating sketches and highly-finished pencil drawings of hundreds of old masters. The site provides itemised hyperlinks to a wide range of museum and auction websites in order to provide researchers with an excellent tool for tracing the current locations of particular items. But the database also includes sketches of innumerable people, places and things encountered by Scharf on his travels up and down the country, making it fascinating for anyone with an interest in Victorian Britain. The database developed out of my chance discovery of an Art Treasures item, a sixteenth century Madonna and Saints by a follower of Cesare da Sesto, in a Dublin church. This led in turn to Scharf’s papers at the Heinz Archive. I was amazed to discover the richness of his sketchbooks, that they were unpublished and not widely known. In order to demonstrate their abundant potential for art historical research, I published an article in Art Bulletin in 2012 which focussed on Scharf’s encounter with works belonging to two neglected Art Treasures lenders, the former industrialist Abraham Darby IV, and a colourful dealer, John Watkins Brett. Following this, I approached staff at the Heinz Archive of the National Portrait Gallery with the aim of producing an online catalogue of Scharf’s Art Treasures sketchbooks. It was not easy at first to secure funding. Many British-based agencies were closed off to me because of my Irish residency and academic affiliation (although I am British, and was born not too far from Manchester). 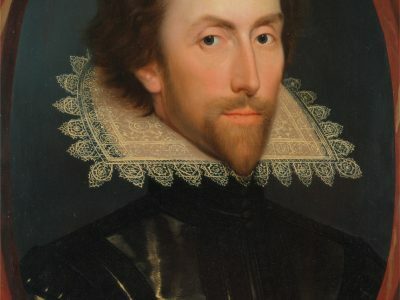 Also, the project was not exclusively focussed on British Portraiture which is, of course, the research priority of the National Portrait Gallery. Nevertheless, with the amazing support and encouragement of staff at the Heinz Archive, particularly Robin Francis and Bryony Millan, I was able to attract the generous support of the Samuel H. Kress Foundation, the Paul Mellon Centre for Studies in British Art, the Thomas Dammann Junior Memorial Trust, as well as seed funding from my own university. The sketchbooks featured in the database admirably reflect how Scharf (fig. 3) was the epitome of a new phenomenon of the age: a professional art historian whose success was founded on tireless industry and carefully cultivated expertise. He was an artist by training, the London-born son of the German émigré painter and illustrator, George Scharf snr. But it was his growing reputation as a connoisseur and art specialist that led the thirty-five-year-old Scharf to be entrusted with a collection of 1,200 paintings by continental artists born prior to 1700. These constituted the Manchester Exhibition’s Gallery of Ancient Masters, yet Scharf’s remit also included loans of antiquities, and he became an important scout with regard to many of the paintings destined for the exhibition’s extensive galleries of British Portraits and Modern Masters (although he scrupulously avoided any involvement with loans by living artists). Between October 1856 and April 1857, Scharf was charged with sourcing and sifting many of the exhibition’s most important loans, taking careful notes and sketches on what he saw. He completed over a hundred visits to important lenders up and down the country, and remained in constant correspondence with many more. 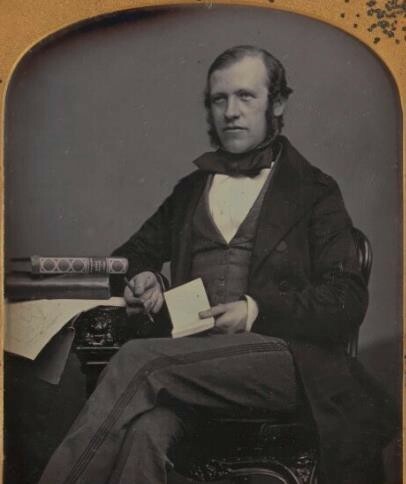 He was still engaged on this mammoth task when, in March 1857, he was also appointed Secretary to the newly founded National Portrait Gallery – a role which eventually evolved into the position of its first Director. My Lord, Mr Peter Cunningham…has expressed so much anxiety to obtain one more picture for our Portrait Gallery that I have summoned up courage to attempt another inroad in your Lordship’s liberality. 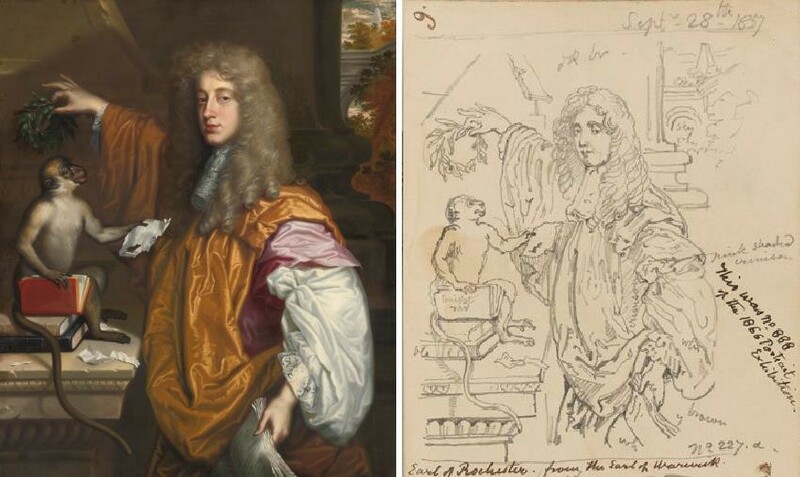 The picture which he considers so important represents Wilmot Earl of Rochester with a monkey…. Should you be pleased to add this it will be conferring an especial favour in a department that I expect will be of a very great interest and prove far more popular than any portrait gallery ever did before. The picture in question, a portrait of John Wilmot, Earl of Rochester, by Jacob Huysmans, was sold at Sotheby’s in London on 9 July, 2014. Exhibited at Manchester with an attribution to Kneller, Scharf made a careful sketch of it in situ at the Art Treasures Palace on 28 September 1857 (fig. 6). 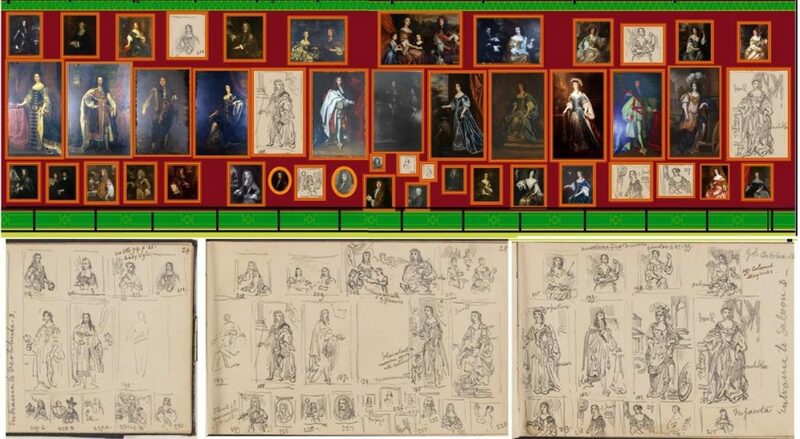 One can now pinpoint its position within an extensive sequence of sketches Scharf made of sections of the Art Treasures hang. These have now been fully indexed in the new database and are of particular value in supplementing and correcting information provided in the exhibition’s published catalogue (which was unillustrated and inaccurate in many details) – see also the author’s reconstruction of a section of the hang (fig. 7). In his meticulous sketches of the exhibition’s British Portrait Gallery, Scharf was obviously eager to fully exploit what constituted the prototype for the National Portrait Gallery in its modern form. In terms of its breadth, scale, and the bespoke grandeur of its hang, the chronologically arranged British Portrait Gallery offered a template for what the National Portrait Gallery would eventually become under Scharf’s thirty-eight-year directorship. It was he who oversaw the numerous expansions and relocations that prefaced the gallery’s final removal in 1896 to its present premises at St Martin’s Place, near Trafalgar Square. 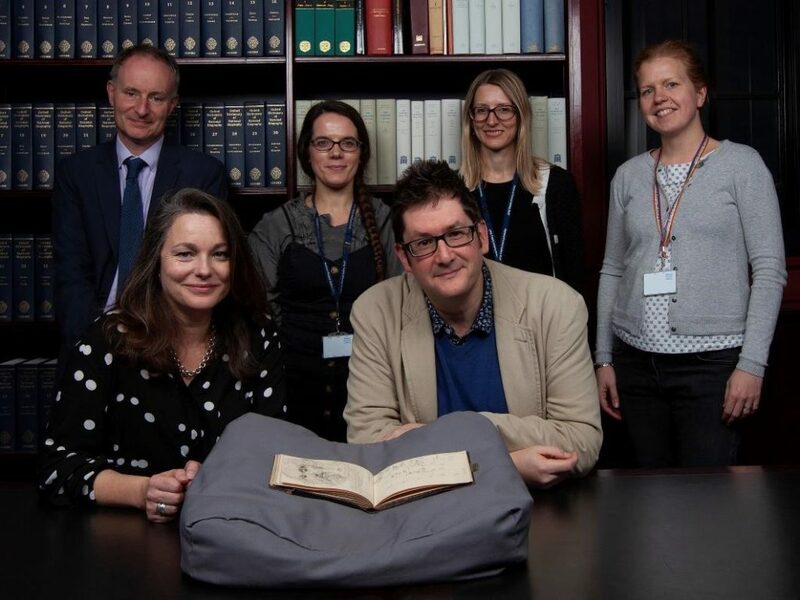 Special thanks go to Gareth Hughes, Collections Manager, Portland Collection, and Emma Cavalier of the National Portrait Gallery, London. I am so interested in this. I am a great admirer of George Scharf, as a draughtsman and as a great museum curator. It is also good to know more about the Manchester exhibition of 1857. He is the Henry Cole of the NPG! Thank you for this.